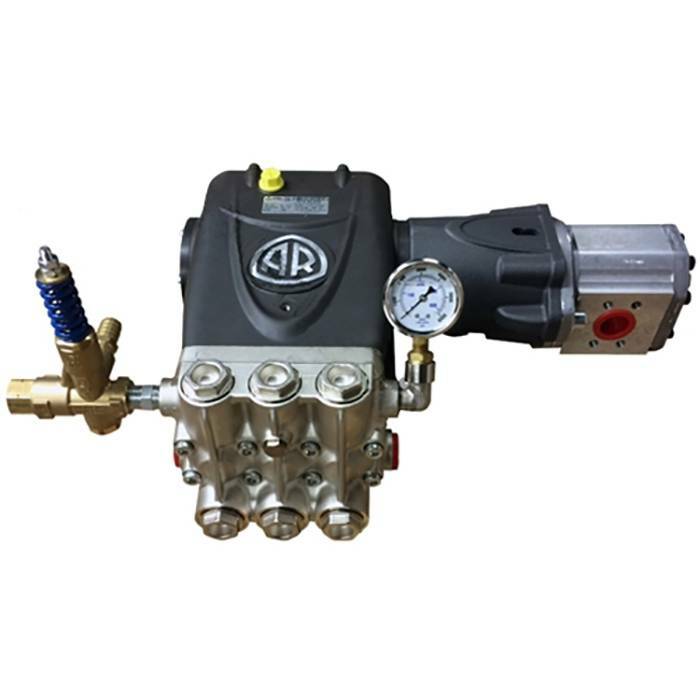 This Heavy Duty Annovi Reverberi hydraulicdrive pressure washer / washdown pump comes with a 5 year manufacturerswarranty. It provides a flow rate of 7.9 to 24 GPM and up to a maximum pressureof 4300 PSI. The VRT Series unloader will allow the operator to adjust flow andpressure rates to effectively avoid backsplash and conserve water when needed. Thepump can be mounted to most vehicles and connected to existing hydraulicsystems, as the pumps hydraulic motor requirements are 18.5 gallons per minuteand its pressure requirements range from 2175 to 3275 PSI depending on themodel. Because this unit is hydraulic fluid driven, no electric power orgasoline is needed; a water supply is all that is required. Thisunit will be plumbed with an Unloader and Pressure Gauge. So after mounting theunit to a proper platform / base plate, all that is needed is the waterinlet plumbing and hydraulic plumbing.